Viennese Artists meeting University of Malta. 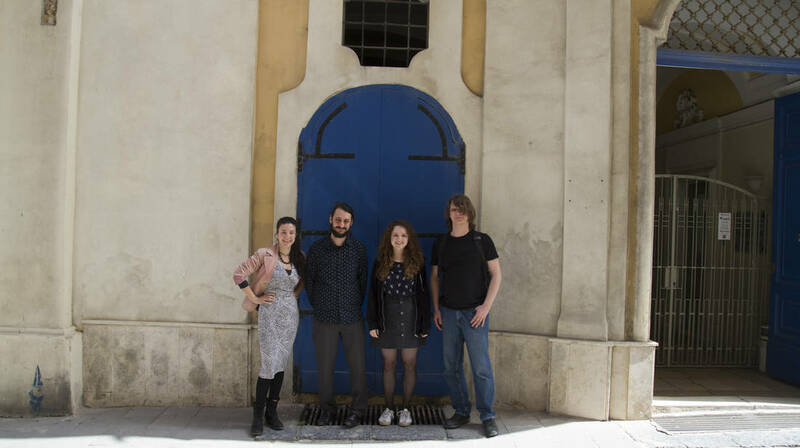 This April, Maltese and Viennese artists met University of Malta’s scientists in the run up to the Science in the City festival happening this 28th of September in Valletta. The artists and scientists will be working together to transform Valletta through a number of scientific and artistic projects planned for the festival. They will be creating a large computer mouse that can be driven around Valletta, high-tech augmented reality art works, and transforming our ideas of carbon, the human body and our history – more to be revealed later. The project has been nearly two years in the making. With Univ.-Prof. Virgil Widrich and project manager Nemanja Popadic from the University of Applied Arts in Vienna collaborating with Prof. Vince Briffa, Dr Edward Duca and Angele Galea from the University of Malta, supported by the Valletta 2018 Foundation. The artists Daniela Brill Estrada and Lala Nomada met archaeologist Dr. Ing. John Betts who combines drone technology with ancient sites, and molecular chemist Dr. David Magri with his Lab-on-a-chip technology. Artist Michael Bachhofer met neuroscientist Dr. Nowell Zammit and game AI researcher Prof. Georgios Yannakakis, whose research inspired a “Black Mirror” episode. Artists Matyou Galea and Matthew Attard met researcher Vanessa Camilleri who created an AR experience highlighting autism, and cognitive scientist Prof. Ian Thornton who studies how the brain represents information that changes over time. The Science in the City – European Researchers’ Night festival, is organised by the University of Malta, the Research Trust of the University of Malta and the Malta Chamber of Scientists together with a large number of partners. It is funded by the European Commission’s Research and Innovation Framework Programme Horizon 2020 (H2020, 2014–2020) by the Marie Skłodowska-Curie actions and recognised as a Festival by Europe for Festivals and Festivals for Europe (EFFE). It is supported by Valletta 2018 Foundation, the Parliamentary Secretary for Financial Services, Digital Economy and Innovation, and a number of corporate sponsors.